Whether you’re new to archery or have been practicing the sport for a long time, you know the importance of a quality compound bow. Shooting a sub-par is not only frustrating but can also be very dangerous to you and to the spectators around you. Making sure that your equipment is safe and up to date is easy to do. A quality bow can improve your shooting and make you more confident on the range. If you hunt or simply shoot on the range at paper targets, you’re sure to want a quality bow that you will enjoy shooting. The Bear Archery Cruzer bow is an easy bow to begin shooting with. You can open up the package and immediately start practicing without having to purchase any additional pieces. This right handed bow has a maximum FPS of 310, depending on the draw weight and length. How you adjust these will affect the FPS that you are able to achieve. It’s a nicely balanced bow that will be the perfect fit for a beginning or someone who is just looking to shoot with something a little different than they already have at home. Some of the pros of this Bear Archery Cruzer bow include how easily you can adjust the bow to your own specifications. It’s perfect for a wide ranger of archers. With the ability to easily change the draw weight from a low 5 pounds up to a higher 70 pounds you can easily personalize this to your shooting. Another easy adjustment for the user is the draw length. At the short end it you can make the draw length only 12 inches, or adjust it all the way up to 30. It’s great that this makes this Bear Archery Cruzer bow not only good for a variety of people, but able to grow with an archer as they get stronger and age. The biggest draw of this bow is the extreme ability to adjust it. A few cons of this bow include that the finish seems to chip easily and the quiver does not seem to be of the highest quality materials available. Add these cons to the fact that the wrist sling doesn’t stay tight and in place with consistent adjustment, and you may find that this bow is more high maintenance than you had originally thought. Another concern is the quality of the LED light on the bow. If you’re hunting at night you might need to look into how to improve this to improve how sneaky you can be. Most of the online customer opinions of the Bear Archery Cruzer bow are highly positive. It’s not the top of the line for a lot of people, but it is a good starter bow and a nice one to have in your collection. It doesn’t matter if you want to use it as a hunting bow or not, it’s perfect for shooting on the range and can have the speed required to make a successful hunt, but only if the draw weight and length are high enough to achieve a high FPS. Otherwise it’s good for target practice. 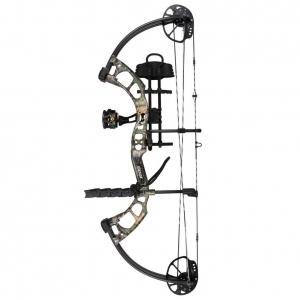 For the average user or beginning archer we do recommend this Bear Archery Cruzer bow. It comes from a long line of quality bows. Just make sure that you’re using it in a safe manner and have really considered the cons that are present. If pieces are coming loose and require consistent adjusting it can be difficult to fire off multiple arrows in a row. Some users might find this very frustrating and feel like it might make it worth while to look into buying another bow.